With fairytale detail, this charming diamond heart pendant from the Enchanted Disney Fine Jewelry collection inspired by Belle blooms with beauty for your princess. 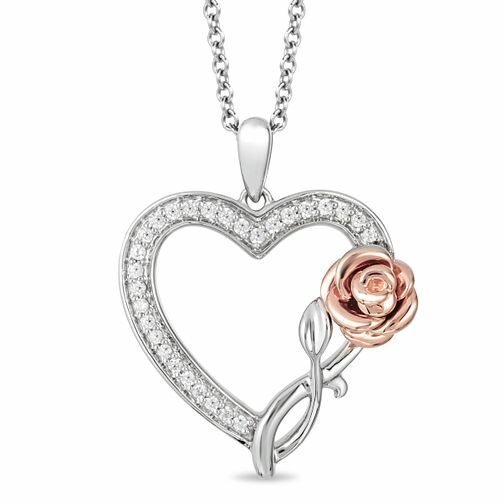 Crafted in sterling silver, this open diamond-lined heart showcases a timeless blossom fashioned in 9 carat rose gold - glistening atop a polished stem along the side of the design. Captivating with 1/5 carat of diamonds and a brilliant buffed luster, this pendant suspends along a 17.0-inch cable chain with 2.0-inch extender that secures with a spring-ring clasp. Enchanted Disney Fine Jewelry Belle Heart & Rose Pendant is rated 5.0 out of 5 by 1.